Demetre H. Chiparus was born in Romania in 1886 and then traveled to Paris before World War I to become more involved with his artwork. He attended school in Italy and at the Ecole des Beaux Arts in Paris, and he exhibited at the Salon in 1914. 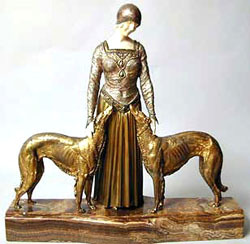 Chiparus was particularly adept in the technique of chryselephantine, the combination of bronze and ivory to produce dramatic, stylized sculpture. He produced most of his renowned works between 1914 and 1933. Paris was an exciting place in the years leading up to World War II, when Art Deco style and swinging good times were in vogue just as in the United States. His later works in the 1920's were influenced by his interest in Egypt, after the excavation of the Pharoah Tutankhmen's tomb. Some of his most exciting works are dancers taken from the Russian Ballet, French theatre, and early motion pictures. 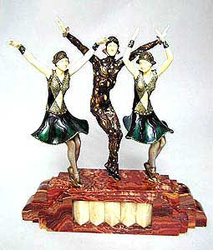 Dancers were captured in movement, dressed in high Art Deco style and long and lean in appearance. Demetre Chiparus worked primarily with the Etling Foundry in Paris, and he died in Pairs in 1947. Period Chiparus work almost always has a foundry name and D. H. Chiparus signature etched in the marble, and usually very hard to find and see. There are many reproduction on the market, and signatures alone mean nothing. Look closely at areas like the fingers; authentic period Chiparus sculptures typically have long, slim fingers with such detail that you can clearly make out each individual fingernail. Examine all the detail, the age of the marble, age lines in the ivory, etc. and consult a professional to protect yourself from unscrupulous dealers and individuals. 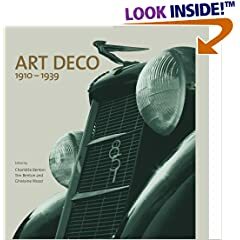 Buy period Art Deco decorative arts on the Art Deco & Art Nouveau and Fine Antiques pages, or search the entire site for great antiques, collectibles, and crafts for every collector! Sell or consign period D. H. Chiparus, Bruno Zach, Preiss, Lorenzl, Fayral, and Frankart bronze and metal Art Deco sculpture, figurines, and lamps at Collectics. Read about our top performing national consignment program for estate and personal collections.